My article in the RepRap Wiki i tried to explain what is happening on the lines when the MOSFET is switching. I showed in Simulation, that heavy spikes can occur, when the freewheeling diode is missing. I talked to another user reporting large spikes on the thermistor inputs of the ADC caused by cross coupling of the spikes on the heater cables to the thermistor cables. With the upcoming trend of also doing PID tuning for the heated bed it will become more and more important to reduce these spikes to a minimum. 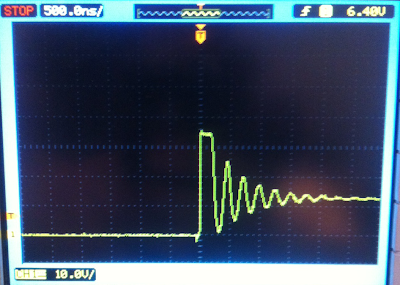 The pictures show the voltage across the MOSFET from Drain to source when switching the hotend/heatbed on and off. Here is an example how it could look like if the switching circuit is well designed. The overshoot is only approx. 4V compared to 50-250V (!!) in conventional designs. All measurements were done on my esasy electronics. Here is an example of a switching a hotend without freewheeling diode. Large spike occur during switching off the hotend. 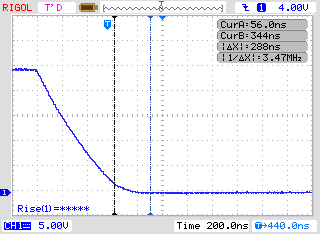 The overshoot is approx 30V above the 12V supply voltage. This means if a FET with lower voltage rating as 60V was used it will be killed sooner or later by these spikes! The heatbed has some minimal overshoot but for the swiched current of approx. 9A it is still an excellent behavior. The hotend shows nearly no overshoot and smooth switchin, which is excellent.